prepared. We announce a call for papers. (and maybe - to stay with us). Among the authors are: Psoy Korolenko, Dmitry Slepovich, Polina Sheperd, Efim Cherny, Zhenya Lopatnik, Evgeny(she) Khazdan, Nina Stepanskaya, Jeffrey Veidlinger, Anna Shternshis, Alexandr Ivanov, Adrianne Cooper, Anatoly Pinsky and others. the new ideas and proposals. The deadline for the materials is 3 December. It took me a long time to get into Chabon's The Yiddish Policemen's Union . For the first half of the book I was struck by the author's imagination—an intriguing, vaguely plausible alternative universe leading up to our time such that many things were the same, and a few, including the local slang in this Yiddish outpost in Sitka, were richly different. But, being clever with language isn't enough. Gradually, the detective story became more exciting, although the ending seemed a bit chaotic. I can't imagine what people who don't know Jewish history and culture read from the book. I don't know how the hints that the book was more than just another interesting curiosity, a Tzadik of the Seven Wonders for our time, came through to readers who haven't read the Hailblum, or more important in this context, who don't see the way in which Chabon has not only woven Jewish possibility into his alternative universe, but also woven an essay on modern, very real, Jewish history into the book, rejecting the Messianism that affects much of modern Jewish identification, and coming down to that very American Jewish—that very American idealist of conclusions: In the end, we have only ourselves on whom to rely, and that must be enough. There is so much here about how basic human decency strives with fear and hope. In the end, this strange, wonderful tale is about love. That too, is good. What is even better, is that unlike current writers such as Jonathan Safran Foer, Chabon seems to have some awareness of Jewish history and culture. There are few musicians in the story (this is where I justify posting about this book to the KlezmerShack), but in affirming the best of the web of influences that are part of the lives of Jewish-identified Americans, they are usually klezmorim. The story would be equally good, if it concerned an exile of Sephardic or even post-first-exilic community with other music. What is important is that the music, while also informed by pop American culture, is, like the rest of the book's roots, organically part of Jewish culture. When I read The Fabulous Adventures of Cavalier and Clay I was struck by how Chabon was writing at an another generation's remove from the Holocaust, choosing to remember it and to make it real for his generation, but also informed by a culture that much more assimilated into American culture than was true when I was young the survivors included parents of my friends. The same is true, if on a bigger canvas, for the The Yiddish Policemen's Union . Both works are ultimately wonderful stories on their own terms, but even more wonderful as one digs into the symbolism, the rich Jewish yikhes, and considers them as great new North American Jewish writing (I say "North American" rather than "American," because I would also include writers such as Toronto's Ann Michaels in that small group). I cannot recommend this book too highly, It is marvellous. And it is a book that is rooted in both Yiddish and American culture in ways that are even more extraordinary. Hazak. Hazak. Hazak. Klezmer Juice in "Una Noche Yidishe"
Please check out the posting of 2 videos from the show "UNA NOCHE YIDISHE" Premiered on October 20th @ the Red Cat theatre in Los Angeles. Award winning songwriter, recording artist and evoloving cantorial soloist, Alisa Fineman's release of "Closing the Distance—Poems, Prayers and Love Songs" is her first Jewish music recording. Produced by jazz guitarist and former Windham Hill artist, Alex de Grassi, she is joined by a stunning array of musicians who add the spice and energy Alisa's voice invites. Peter Yarrow of Peter Paul and Mary says, "… a marvelous addition to the contemporary voices who continue to give life and vitality to the Jewish tradition. Alisa's heart is as warm as her superb voice." For details, see the artist's website at www.alisafineman.com. I've been working on a blog about klezmer, Learning Tsymbaly, and learning the tsimbl/tsymbaly from an amateur Canadian point of view. I usually play klezmer music on it, but I'm also interested in Ukrainian-Canadian tsymbaly music. Within these several smaller themes could be considered. There will be a session devoted to interviewing close family members of exiled composers. To understand the centrality of women in the world of Yiddish, one need only look to our title for this year's theme, the coziest and most intimate expression used to describe our language: Mame Loshn: Mother Tongue. prayers and commentary)—to the unprecedented number of women on today's klezmer bandstands, the contributions of women to the vitality of Yiddish culture are undiminished. To celebrate this tradition, KlezKamp—whose staff is 51% women—focuses on heroines such as poet Beyle Schaechter-Gottesman and veteran drummer Elaine Hoffman Watts, both winners of the prestigious National Endowment for the Arts National Heritage Folklife Award. (Elaine, along with daughter Susan Watts, will be recording a new CD during KlezKamp, another in our "A Living Tradition" anthology series.) We also welcome dance historian Judith Brin Ingber and legendary onagenarian pianist Shirlee Paul, and welcome back literary scholar Anita Norich. Beyond the Mame Loshn theme, KlezKamp offers its vast array of Yiddish arts including multi-tiered music classes, an expanded vocal program, all-Yiddish offerings, more general interest classes and our second-to-none KlezKids program and teen theater troupe. Our venue, the Hudson Valley Resort and Spa, offers luxury in the Catskill tradition, with a kitchen run by celebrated Culinary Institute of American graduate Chef Ed Kelly under the shtreng Glatt Kosher hashgokhe of Ha-rov Gershon Kreuser. Now in our 23rd year, KlezKamp continues to innovate and inspire as a model for the vigorous and widespread resurgence of Yiddish culture around the world. 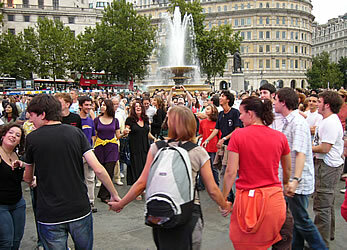 Be one of thousands who, over the years, have made KlezKamp the Capitol of Yiddishland. and we will be happy to send one to you. Please email us the names of others you think would be interested in receiving information. 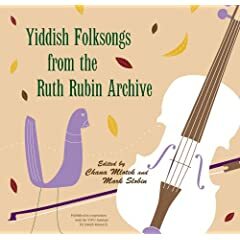 "Yiddish Folksongs from the Ruth Rubin Archive"
Dr Ruth Rubin dedicated her life to preserving Yiddish folk songs. Over the course of her career, Rubin collected some 2,000 songs from generations of people who had grown up in a flourishing Yiddish-speaking environment that was mostly ruined by Nazi annihilation and Stalinist repression. This collection is based on a manuscript that Rubin was unable to publish before her death, with additional annotation and commentary provided by noted music scholars Chana Mlotek and Mark Slobin. Hankus Netsky is the founder and director of the internationally renowned Klezmer Conservatory Band. He has composed extensively for film and television and has collaborated with such artists as Itzhak Perlman, Robin Williams, Joel Grey and Theodore Bikel. about Yiddish folk songs and their importance to Jewish life. Mark Slobin is a professor of music at Wesleyan University and a scholar of Jewish and Central European music. He is the author of "Tenement Songs: Popular Music of the Jewish Immigrants" and "Exploring the Klezmer World. Community Center, 333 Nahanton Street, Newton Centre, MA.